The gear box is printed in Shapeways Black Strong and Flexible, which is just the White Strong and Flexible material with a black outer layer. I feel the finish in the WSF is much better and I would use it and paint it. WSF is very strong. 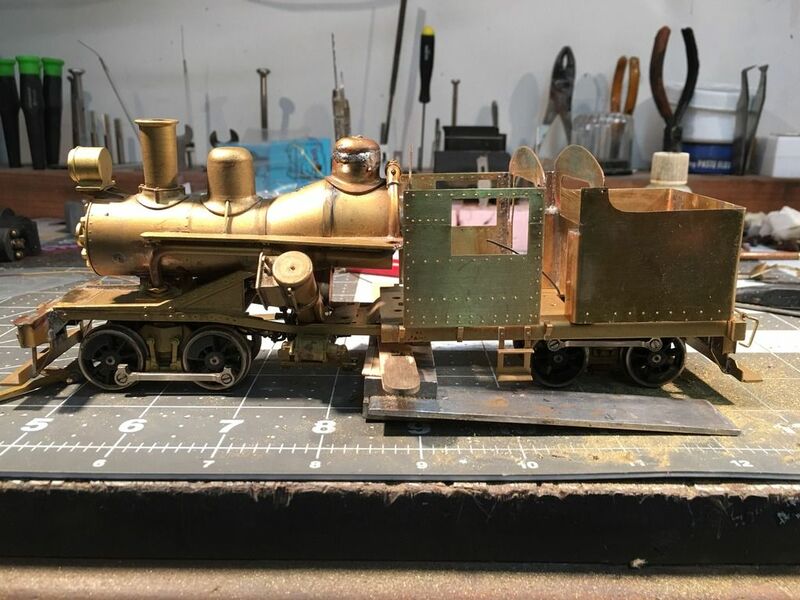 I did a structure out of the WSF and made the walls 0.060" think and I can bend it back on itself and it won't break, so yes locomotive frames would be very easy to do. The draw back on printing locomotive frames will be the lack of weight. For CAD I use a very expensive program called Inventor, which is an Autodesk product. Inventor has a sheet metal add-in that I use which will flatten out the bent up model so I can make the etching layouts. I use CAD everyday at my work so it is basically an extension of my hand, and I can work in it as fast as I can think, which really helps out because you could have as much time in just designing a part as you could if you just build it, of course the advantage is the high level of accuracy. When you design in Cad it is not just as easy as making the parts either, you will have to be aware of "fit". The tendency when working with Cad is to make everything the exact size and if you don't allow for clearances the parts may not go together. 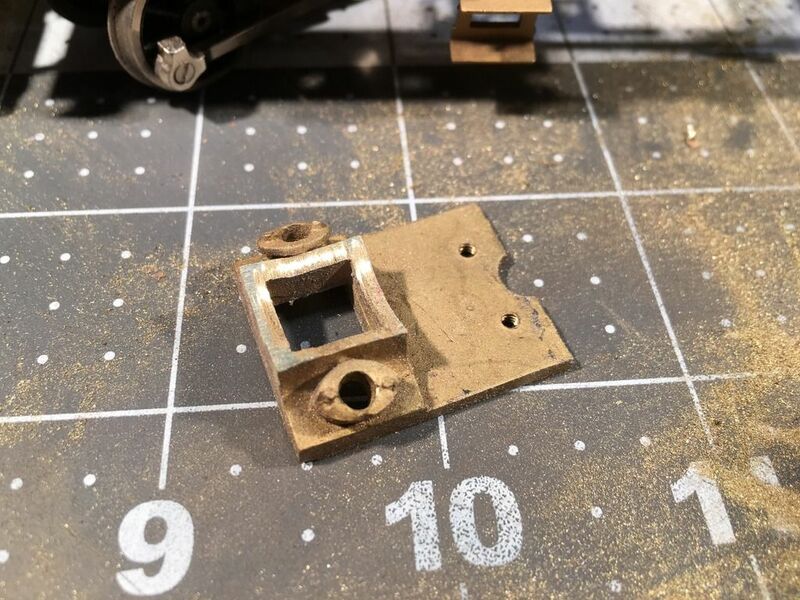 for example the bushings in the gear box need some clearances around them and then some clearances between the ends of the bushings and gears. Thank you! Having only experienced frosted ultra detail i wasn't sure how the other materials held up. very interesting. 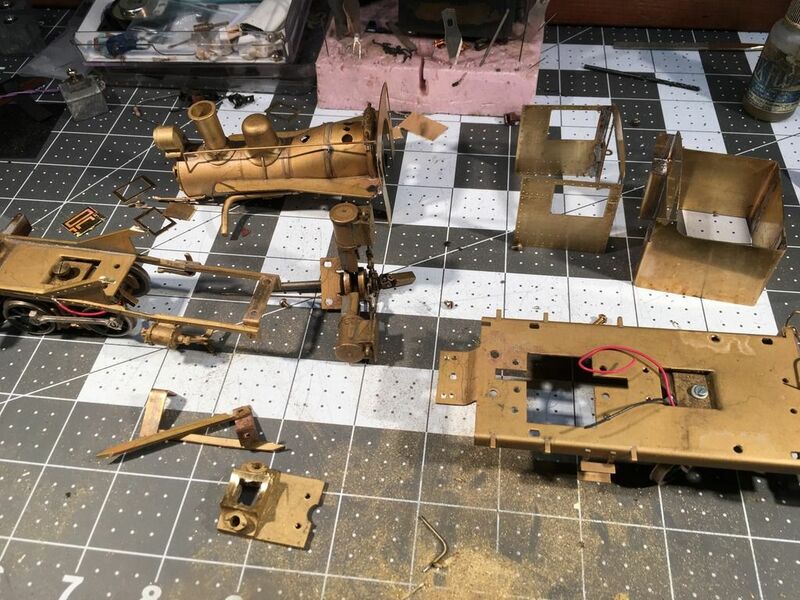 started putting the Heisler cab parts together. 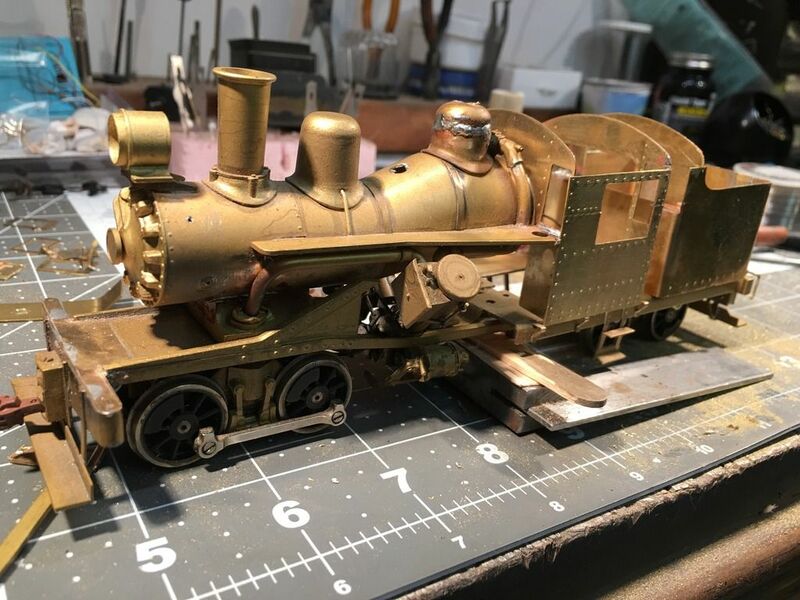 I did a little research on the Westside Models Heisler and it turns out they first made it in HOn3, and when they had it made in On3 the manufacture just doubled all the dimensions, which makes the locomotive actually slightly oversized in all dimensions. 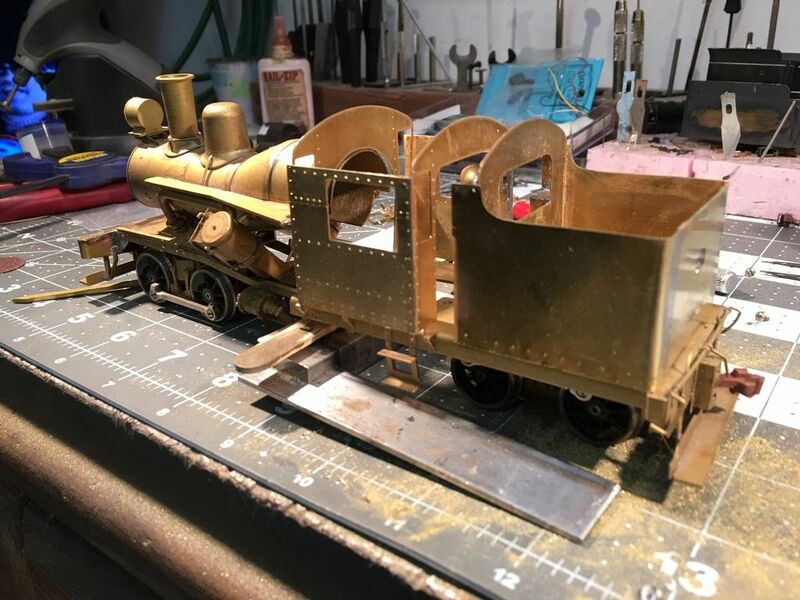 The cab I am making really helps reduce the model to look more correct but I think I want to lower the boiler a little to make the locomotive not look so towering. I also may shorten it just a little as well. Nice real nice. Great work. Does it need to slide forward a bit from this position? If you move the steps back, with they interfere with the rear truck? 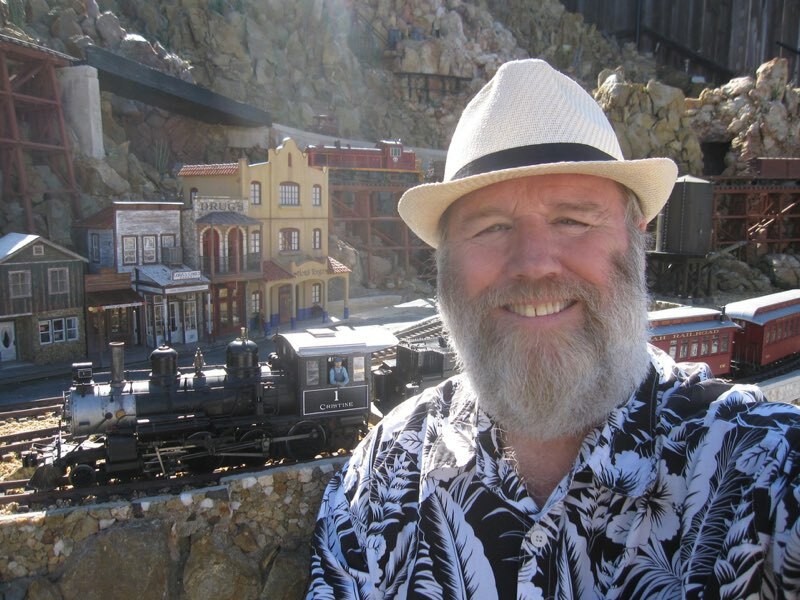 Is the motor in the firebox? Will that interfere with lowering the boiler? the motor is in the fire box and there is room to lower the boiler. The cab steps are not factory Heisler steps, those are ones that the WSLC made. The factory Heisler steps are slightly sloped outward at the bottom, kind of like caboose steps but a lot steeper. 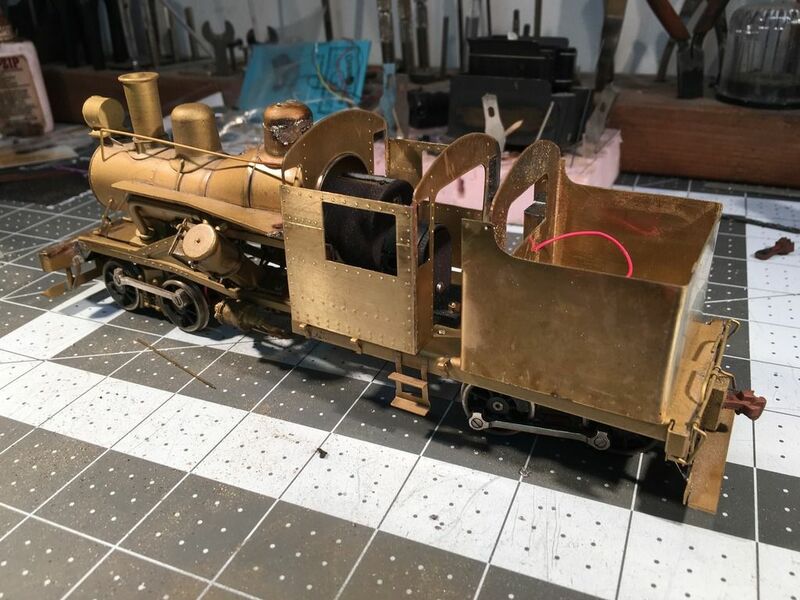 The steps will for sure clear those narrow gauge trucks because they are a lot narrower than shay and Climax trucks because they are inside framed. Actually it is the narrowness of the trucks that make this locomotive look so awkward on the rails, sort of top heavy looking, which should get better when I lower the boiler a bit. you can see that I am also lowering the steam dome. The original steam dome looked as tall as the sand dome. Not that a steam dome can't be tall but typically the steam dome is more squat looking than a sand dome. here is the boiler saddle that was ground down. I soldered a new top on it that was formed to the bottom of the boiler. here are the parts placed together to see how it looks. It might seam like lowering it 3/16" and shortening it 1/2" might not be much but it helped tighten up the look of it. I cannot see myself EVER pulling apart a model like this. I am sure that if I tried, it would remain in pieces from that time onward. Did you know you were going to lower the boiler when you built the cab? If you look at one of the earlier photos you can see the cab front is high compared to the side walls. I knew that the locomotive was too high and I wanted to squat it down a bit for a while now. Wow, this is a major rebuild job! took a break from the Heisler and hit the lakes for fishing opener, so not much happening on the RR. I did sit down with some AK Interactive and MIG weathering products to see what I could do. 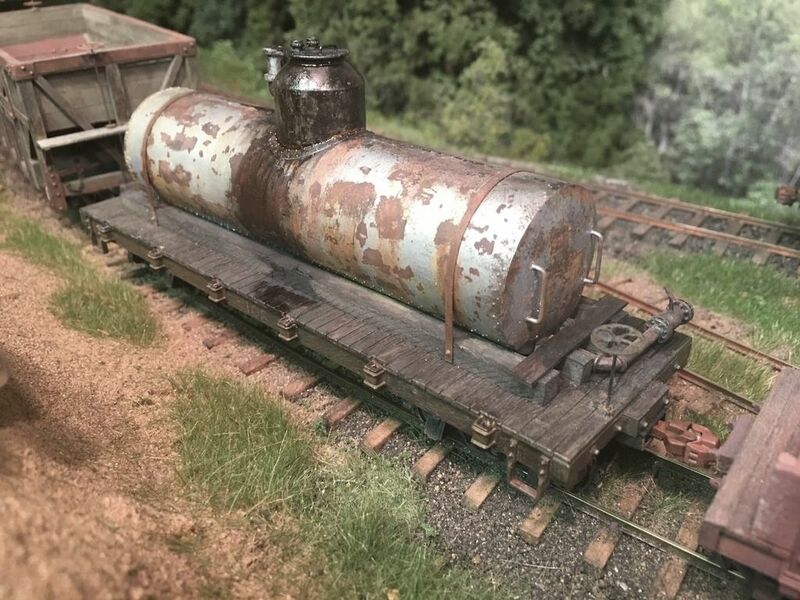 I used the Heavy Chipping fluid on this tank car a while ago but I figured that if it was going to haul creosote that it should look like it was at least loaded a few times with it. I used some MIG black pigment and some MIG Fresh Engine Oil to create a nasty slime on the dome and down the side. I also used some MIG rust washes to add some stains on the silver from the chipped rust spots. this car used to have a wood railing but I like it better without it. 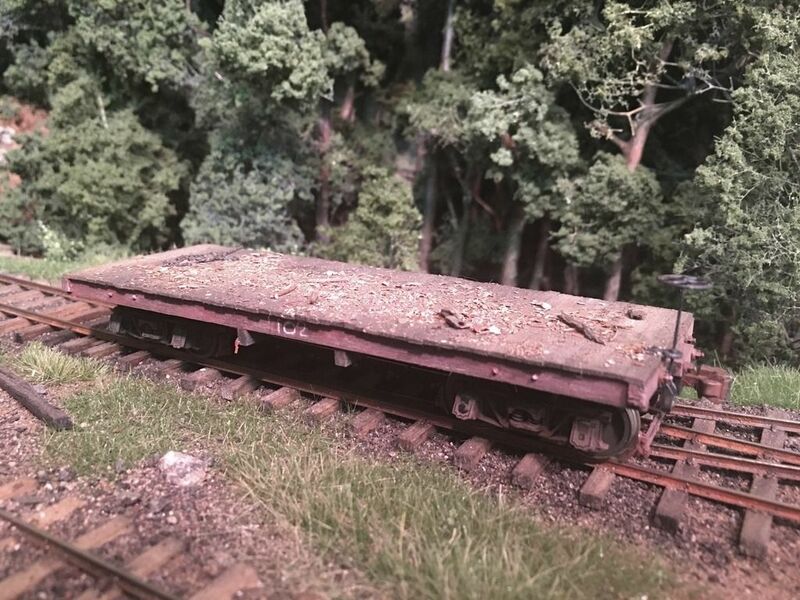 The next thing I wanted to do some test on was this little 18' flat car. I wanted to see what I could do with the deck to make it nasty looking. Some flat cars I have seen have really tore up looking decks with heavy stains. I hacked away at the deck to make it look really beat up and the did a new wash of AI black. When the AI wash dried I used some earth washes and pigments from AK Interactive and MIG. I had some ground up leaf and twig material that I scattered on the surface, which was bonded with Matte Medium. for the photo I spread a little more junk, however it is way to much I think for what this car would haul. I have lost track - which couplers are you using now? I have switched over to Sergent S scale couplers, they look great don't they? I have become used to them already and I like them a lot better then I first did. The couplers are excellent - that's why I asked. Have to take a road trip some day for a visit. The tankcar came out very nice. The overall size and finish of the tank car is a good compliment to your hoppers.